I’ve mentioned before my weakness for fried food. It’s definitely a group of foods I don’t eat often and it’s rare that I make anything fried at home (the oil!) However, over the years, I’ve morphed how I make dumplings to help give me a taste of something salty and crunchy. 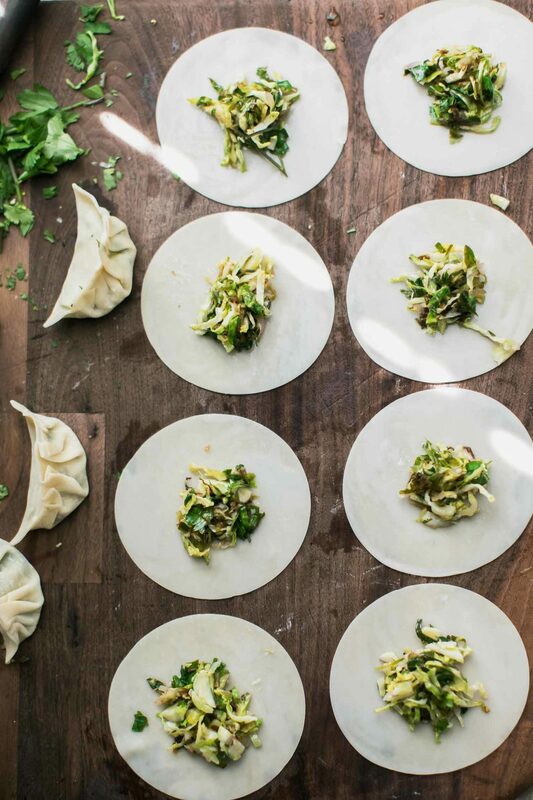 These Brussels sprout potstickers are quite possibly my favorite. I will always throw cabbage into dumplings and this version is just an extension of that. There’s a few ways you can go about shaving Brussels sprouts: a mandoline, a food processor with a shredding attachment, or a sharp knife. I typically choose the knife but the food processor makes quick work of the small heads. Crisp dumplings made with shredded Brussels sprouts for an easy and delicious winter treat. Heat olive oil in a large skillet. Add minced scallion and cook for 2 minutes. Add in Brussels Sprouts, lemon juice, and ginger; cooking until Brussels sprouts are brighter in color and just tender, 3-4 minutes. Remove from heat and stir in the parsley and cilantro. Set up an assembling station with a small bowl of water, filling, and wrappers. Working with one skin at a time, place about 1 tablespoon of filling in the middle. Dip your finger in the water and run it along the entire edge of the wrapper. Fold both ends up (or corners if you are using square wrappers) and lightly pinch. Working with one side, pleat and pinch together making sure that once pleated, the potsticker is sealed. Repeat with remaining filling and wrappers. Wipe out the skillet you used for the filling, return to medium-low heat, and add enough oil to cover the bottom of the pan (you only need a thin layer). Working in batches if necessary, place potstickers, flat-side down, into the oil without crowding the pan. Cook for 2 minutes or so, until the side is crisp and golden. Flip, cook for another 2 minutes or so and transfer to a plate. Serve the dumplings with a side of soy sauce and a sprinkle of toasted sesame seeds. Tips & Tricks: If you have extra time, I recommend doubling/tripling the batch and freeze the extra. To freeze, after pleating, place on a tray so that no potsticker is touching another and freeze. Once frozen you may then transfer to a container. When ready to eat, you can cook them frozen- just allow for a little extra time. Cabbage: As mentioned above, you could easily add or swap out the Brussels Sprouts for a bit of shredded cabbage. Other hearty greens or even broccoli would work as well. Garlic: Swap out the onion for a clove or two of minced garlic. Gluten-Free: Most of the wrappers you find in stores are not gluten-free. However, wrappers are easy to make at home- here’s a recipe. As mentioned above, I’m all about Brussels sprouts right now. There’s not much I won’t do with a Brussels sprout, as evidence by the recipes below and this Brussels sprout pizza. Look for Brussels sprouts that have a good green color and have a firmness when pressed. If you can find them, Brussels sprouts sold on stalks can be a good indication of freshness. Oh WOW!!!! Sounds amazing!! Must try soon!!! 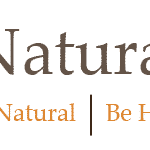 your photography is beautiful and your creativity with recipes is inspirational. Thanks for sharing, as always! I am not a big brussels sprouts fan, but I could definitely get into this recipe! Mmmmmm I love pot stickers! But I’ve always thought they looked to “scary” to make. But these don’t look all that bad!! Will have to try them! Love this! Such a unique recipe idea. Brussels Sprouts are a love of mine, so this is one perfect winter dinner we’ll be having once ours are ready to pick! Hi Erin – I LOVE this creative idea for brussels sprouts! Pinned and can’t wait to try this recipe. Hurray brussels sprouts are almost in season! Assembling potstickers, tortellini, ravioli, etc has always really intimidated me. It’s great to hear that it isn’t too hard learn. Fantastic photos! While I can’t vouch for tortellini (still on my list) potstickers and ravioli come fairly easy once you get the hang of it! 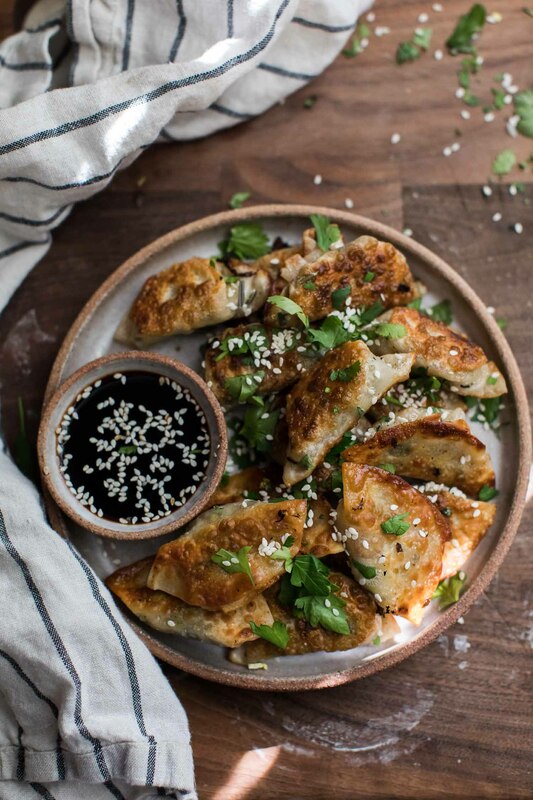 I’ve yet to attempt potstickers yet you make them sound so…doable. It’s such a shame because I find them so fabulous. And I love this fall-infused filling! 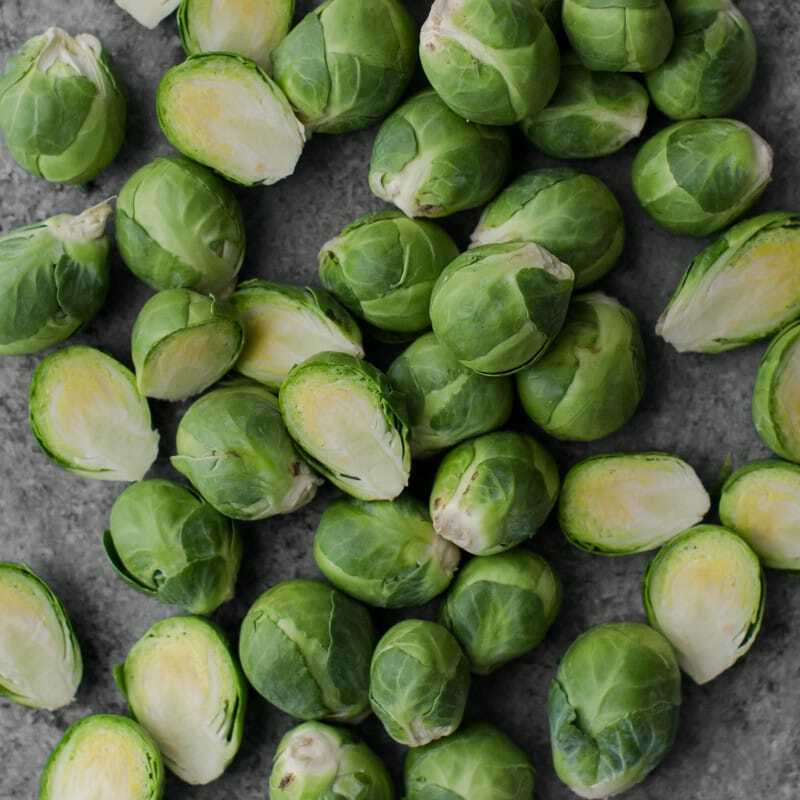 where does the asterisk on “brussels sprouts” go to!??! I’d love to try your recipe for making potstickers for the first time! What type of wrappers do you use? Can it be found at any food store? This was delicious! Thanks for posting your recipe. I have lots of tatsoi from my CSA box and I’ll probably make some more potstickers using that instead of brussels sprouts. What brand of wrappers did you use? I cannot find any gluten free ones. Another winner! Made a big batch last night to put in my lunches for the week. Wonderful- what a perfect lunch! Made (a variation on) these and they were wonderful, I loved the texture of the brussels and flavor of the herbs. I added mushrooms and edamame, because I already had some at the house that needed to be used. Quick question — I shredded the brussels using a mandoline, but see you have the food processor pictured above. Did you just pulse them fitted with a regular blade, or use a separate attachment? I took your advice and froze a bunch, but my stores are waning and its time to make a new batch! Thanks for the great recipe! Hi Heather, I used he slicing attachment the food processor has (and it makes quick work of the shredding!) I bet, however, you could also potentially just pulse them with the regular blade and get something similar. Let me know if you try that! Erin, years ago I learned the Chinese technique for making potstickers: fry in very little oil until bottoms are golden and crisp. Then, with the lid for the pot poised over it, add about ¼ cup water or broth, lower the lid onto the pot and cook until water is gone. I can’t unfortunately be more specific about the directions because I probably haven’t made potstickers for 30 years or more, but I’m sure you could figure it out. They are supposed to be part fried, part steamed. I am sure this recipe is wonderful, and will definitely make it when I have the energy and ambition. I’m curious if these can be baked at a high’ish temp, maybe spraying them with an oil spritz or Pam. I’m trying to minimize calories. Yup! I have a couple recipes that are baked instead: https://naturallyella.com/bakedsweetpotatopotstickers/ The texture isn’t quite the same but it’s still delicious!